I was having serious algae issues in my Discus/community tank. This improved immediately on adding my DIY scrubber, but it was still a problem, and I couldn't get my NO3 below 10ppm, even with frequent water changes, and cutting back on feeding drastically. I tried doubling the screen surface area by creating a 'horse shoe' configuration in the plastic tub I am using, and adding more lights (see picture). A little better. I was happy, but still not the nirvana I was hoping for. Eventually, I had to replace one of my 175 gpm pumps, so I bought a 400 gpm fountain pump as a replacement (it's all they had). My tank is 50 gallons, so the water is being turned over 8 times per hour (probably 5-6, realistically). I put a plastic ball valve on the pump outlet so it didn't overpower my return pumps, and a deflector on the water return to prevent excessive current in the tank. I didn't expect anything to change, I just needed to replace a pump. INSTANT improvement! My NO3 was now consistently under 5ppm, although still present. Apparently my flow rate was insufficient all that time! I noticed that the slot where the plastic screen inserts into the PVC pipe was getting clogged with algae by the time it needed cleaning. It never clogged completely but still, to make the flow and distribution more consistent, I cut a few 'V' shaped notches in the screen, 1/3 inch wide and 3/4 inch long, where it inserts into the PVC. That increased the flow rate even more, and BINGO! My NO3 is now completely undetectable, even after not changing my water for weeks! Amazing! The fish are all happy and healthy. Algae in the tank is almost non-existent and diminishing. I haven't had to clean my glass in months! I've increased my feed rate again, and still 0 Nitrate. The new leaves on my Amazon Sword Plant are actually growing in a little pale; I may need to get some plant fertilizer spikes! 1. my plastic tub is actually two stackable tubs from OfficeMax ($8 ea, with lids). I cut a hole in the floor of the top tub, to create a little sump in the bottom tub, where I keep the return pump. 2. i have 4 LED light arrays, 9W each, bought from a designer concrete company (???) 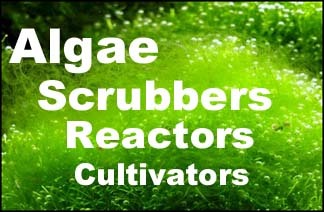 here ->https://www.expressions-ltd.com/prod...algae-scrubber. There are cheaper solutions, but these save a lot of space, and have lasted over a year with no issues. 3. The fountain pumps have internal float switches to turn them off on low water level... nice. All bought at hardware store. water is a little cloudy, as I just reorganized the plants, etc. Great to hear. Usually it's the lighting that's the problem, but if your slot is cutting off flow then it could be the problem too, as you found out. Also shows how much more powerful scrubbers are than water changes. If you need to help your plants, just dose some iron, instead of ferts.